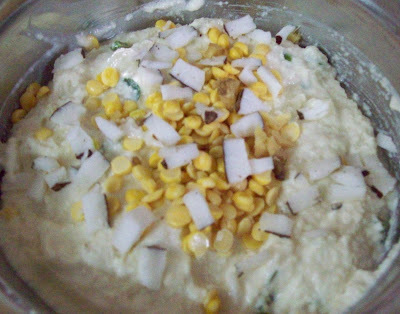 Rava wada is very simple, does not take in much oil, very tasty, a wonderful snack to have with tea or coffee. 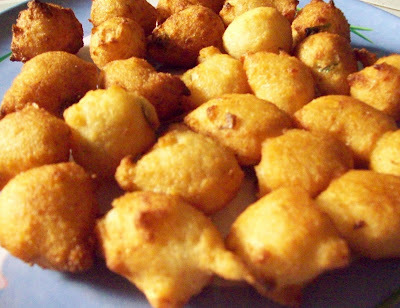 My Amma used to make this as a vadai for prasadam.It is my family’s favorite snack. . This is very delicious when you eat it hotor cold. The output is a very crunchy pakoda on the outside but chewy and soft on the inside. Can be eaten with or without chutney or sauce. Heat the oil and just sprinkle like pakodas. When it turns golden brown remove and serve it hot. I love these tangy vadas. Its my nephews favorite, we used to buy these from street vendors. But it certainly is healthier to make them at home. Pretty pretty! I like those coconut pieces you have added. A touch of authentic south Indian food. First time to your blog. Loved all your recipes. The rava vadas look so delicious. These look so delicious and I love that this requires no soaking, grinding and can be made at a moment's notice. Happy Dusshera to You and your family Jaishree!!! Lovely idea,I am surely trying out this some day!! I must try this. :) Thank you.